The standard analog audio interconnect is the most common type of short-run cable connector in any home theater. Audio interconnects use a standardized RCA jack. Traditionally, these cables come in pairs for two-channel (stereo) audio connections. Any audio interconnect with RCA jacks will plug in to any corresponding RCA plug on a piece of A/V equipment. 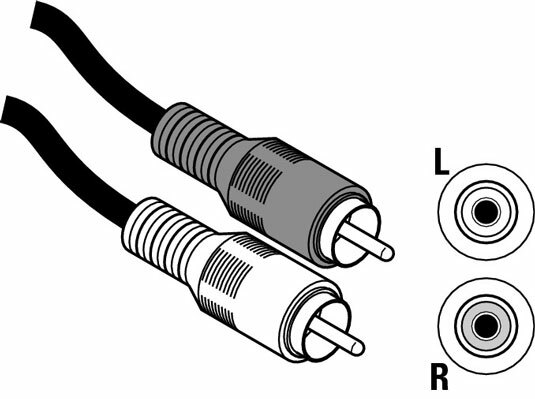 Here’s an image of RCA plugs on a stereo (dual) pair of audio interconnects. Look familiar? If you go shopping for audio interconnects, you’ll find a huge array of different cable constructions. The typical audio interconnect is a coaxial cable, which means that it has two electrical conductors surrounded by a shielded jacket within the cable. This jacket is called shielded because it is designed to keep stray electromagnetic energy from getting into the conductors and causing interference with the audio signal. Some cables are unshielded but twisted. Twisting has a similar effect to shielding — twisted cables can cancel out interferences.